The CRT unit suffices for simple graphics, but most graphical console applications require the graph unit. The WinGraph unit (together with the WinCrt and WinMouse units) used in many student programs has extended functionality. Our first demonstration program using the graph window puts labelled marks every 100 pixels along the x and y axes, so that you can estimate the coordinates to use for your shapes. It shows how to select the graphics mode automatically. Gd := Detect;  //Set graphics driver to 0. Gm := 0;       //Graphics mode will be set automatically. //Put labelled marks every 100 pixels along the x axis. //Put labelled marks every 100 pixels along the y axis. The following screenshot shows part of the output. 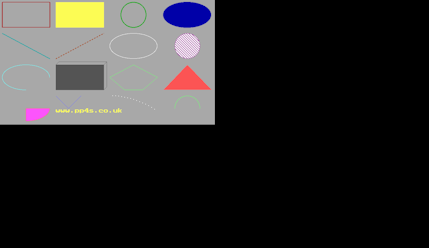 You can draw many shapes with the Graph unit, as demonstrated in program Draw. This program divides the window into four rows and four columns and draws each shape within one of the 16 cells. 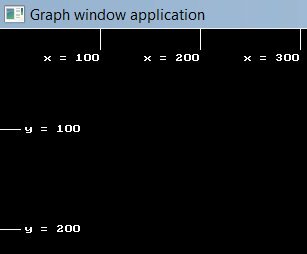 The program uses the following procedures and functions in the Graph unit. SetColor(TextColour) sets the text colour to TextColour. Rectangle(x1, x2, y1, y2) draws a rectangle outline with upper left corner at x1,y1 and lower left corner at x2,y2. SetFillStyle(FillType, FillColour) sets the fill type (e.g. SolidFill, BkSlashFill) and the fill colour. SetLineStyle( LineStyle, Pattern, Thickness) sets the style of a line. LineStyle may be, for example, Solidln, Dashedln or UserBitln. Thickness can be set to NormWidth or ThickWidth. Pattern is ignored and can be set to 0 unless your style is UserBitln. Bar(x1, x2, y1, y2) draws a filled rectangle with upper left corner at x1,y1 and lower left corner at x2,y2. Bar3d(x1, x2, y1, y2, BarDepth, Top)draws a 3-dimensional bar with upper left corner at x1,y1 and lower left corner at x2,y2. BarDepth specifies the depth of the bar in pixels. If the Boolean variable Top is True, then the top will be 3-dimensional. Circle(x1, y1, CircleRadius) draws a circle with centre at x1,y1 and radius CircleRadius. MoveTo(x, y) moves the cursor to point x,y. LineTo(x, y) draws a line from the cursor position to point x,y. Ellipse(x, y, Direction1, Direction2, xRadius, yRadius) draws a partial ellipse with centre x,y, radii xRadius and yRadius, between Direction1 and Direction2. Directions are measures in degrees, with 0 being along the x- axis (pointing right) and 90 along the y-axis (pointing up). Arc(x, y, Direction1, Direction2, CircleRadius) draws an arc of a circle with centre x,y and radius CircleRadius from Direction1 to Direction2 (defined as for the partial ellipse). 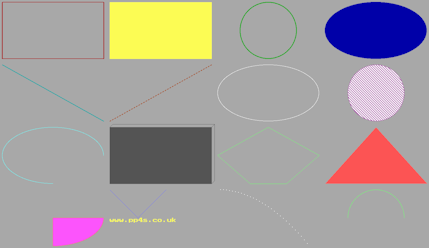 DrawPoly(NumberOfPoints, ArrayOfPoints) draws a polygon. ArrayOfPoints is an array holding the x and y coordinates of each point, beginning and ending with the coordinates of the first point. NumberOfPoints is the total number of points in the array, which is one more than the number of vertices in the polygon. PutPixel(x, y, PixelColour) draws a pixel of colour PixelColour at point x,y. Figure 1, the full-screen output from program Draw running on Windows Vista, shows some incomplete shapes. The workaround to obtain the desired output shown in Figure 2 was to minimise the graphic window then maximise it. Apparently the redraw works better than the first attempt. Figure 3 shows the output (after the workaround) on selecting the quarter size option. This code demonstrates how vector graphics are scaled easily and effectively. See this part of the table of programs for many fine examples of the use of the WinGraph unit. We recommend in particular GASP and Knowledge by Peter Hearnshaw and Game Of Life by James Hall.